I’m not what anyone would call an avid baseball fan. I enjoyed playing shortstop when I was younger, a spring/summer tradition that lasted until high school drama took over. I have been to and been absorbed by a few games, but it’s as much the live experience that I’m after as the game itself. And there have been times when I have been at someone else’s house (or bar) with absolutely nothing else to do, and I have sat down with someone and “watched the game.” It’s a pleasant experience and then I never think about it again. I don’t keep up with scores. My choice to root for a particular team is not even instinctual or territorial – it’s arbitrary. 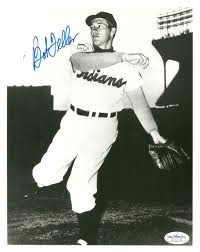 So I surprised myself last night by getting blindsided by the death of Bob Feller. Shouldn’t have been – he was 92, and I hadn’t thought about him consciously in a decade. But for almost the entire time I lived under my parents’ roof, there was an autographed publicity photo of Bob Feller on the wall across from my bed. It was a gift from my father. And man, did he love baseball. My father was an enormously formative figure in my life, and remains so twenty years after his death from cancer at age 40. I loved him, of course, but I also sensed even at the time a sort of alien kinship between us – that we were very similar people constitutionally who were trying to do some very different things. I’m not writing this to explore the psychodynamics of my relationship to my father. They weren’t that complicated, and if they are, then that’s what plays are for. I just want to illustrate that some things in my life I loved not because it was natural for me to do so, but because I loved how much my father loved them. And he did. Tom Trull was a man of boundless, infectious enthusiasm for the things that he loved. Never mind that my father didn’t make it to the era of cell phones. I do so wonder if he’s up. I’m sure mine still exists in a box somewhere. There are so many boxes. I do, however, have a slightly more contemporary sports action photo on my wall, just above my writing desk where I seem to spend 80 percent of my time. It’s a triptych photo of my father doing the thing he loved best and excelled at in the last decade of his life: playing golf.